The recent visit to Pakistan by Chinese President Xi Jing Ping secured $46b for development of power and infrastructure sector. This sizeable Chinese foreign investment will help Pakistan’s economy significantly. The elevation from “iron friends” to an all weather strategic partnership relationship between the two nations was significant. After signing more than 50 cooperation deals between the two countries promises to raise the bilateral trade from $16b to $20b over three years was planned. The proposed development plan of China Pakistan Economic corridor where the Silk Road Economic Belt and the 21st Century Maritime Silk Road meet is significant. It will affect the entire south Asian region. According Xi “We need to form a ‘1+4’ cooperation structure with the CPEC at the center and the Gwadar Port, transport infrastructure, energy and industrial cooperation being the four key areas to achieve a win-win result and common development,” This statement reflects the deep interest and commitment of China to support nations such as Pakistan. Similar initiatives launched in other South Asian nations such as Sri Lanka’s Hambanthota port will contribute immensely to regional economic and trade enhancement and intensification . China, a giant neighbour to South Asia will work closely and strengthen its relationship with South Asia over the next decade. Pakistan and China who assisted Sri Lanka to defeat the terrorist LTTE could work together on further improving and contributing toward international counter terrorism efforts and enhancing counter terrorism capacity building in the region. The large scale flow of Chinese assistance to developing nations in South Asia and Africa will be a great relief to these nations who battle to improve the economic conditions. President Xi’s next stop was Indonesia, participating in the 60th Anniversary of the Bandung Conference. Bandung was the first panAsia- Africa conference in which Sri Lanka and many countries freshly out of British colonialism played a significant role. 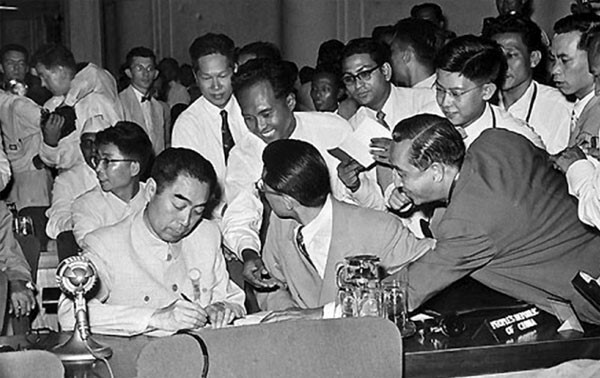 This landmark conference took place in 1955 and created a new era in South-South international relations. The conference represented one-quarter of the Earth’s land surface and a total population of 1.5 billion people. Today again ( just as the spirit of Bandung) it is important to strengthen Afro -Asian South-South connections with the existing geo strategic landscape .The US pivot to Asia and China’s One road one belt strategy are existing global indicators to this necessary shift from Western dependence to global internationalism . Both existing powers and emerging powers have shown their deep interest in Afro-Asia economic development. It is important to collaborate and strengthen Afro-Asian security threats specially in the struggle against local and global terrorism. In Asia, two dozen groups support IS. Over 1000 recruits from Central Asia, South Asia, Southeast Asia, China, Australia and New Zealand have traveled to Syria and Iraq. The al Qaeda centric threat landscape is eclipsed by an al Qaeda-IS hybrid global threat. Today, al Qaeda and IS compete for supremacy of the terrorist movement. The recent massacre in Kenya is a humanitarian disgrace and we should look at multinational, multi-pronged, multi-agency, and a multi-jurisdictional framework to fight upstream counter radicalization and downstream de-radicalization. At Bandung its important to look at the present geo security situation which has threaten the entire world. China with its one road one belt strategy will definitely assist many countries in Asia and Africa. China with its large investments to developing nations in Asia and Africa has contributed immensely for the economic development and has improved millions of lives. You could see this in Sri Lanka and how the nation has benefited immensely from Chinese investments on infrastructure including the first high way, ports etc. China was a friend at the time when the nation was battling with terrorism. At Bandung in 1955 China played an important role in the conference and strengthened its relations with other Afro-Asian nations. Chinese premier Zhou Enlai held a very positive attitude and support to strengthen Afro Asian relations. Zhou stated he had come to seek unity and not to quarrel, to seek common ground and not to create divergence, he invited the participants to visit China saying: “It is better to see for oneself rather than to hear many times.” The 18 minute speech won acclaim at that time. Unlike in the past defending its position to secure communism in the present day China’s new role is reawakening the sleeping giant the Maritime Silk Road (MSR) which will benefit many nations and global trade. President Xi wished to strengthen this cooperation as good friends and brothers. This is a very important remark at a time both Asia and Africa is facing many challenges to improve the economic environment in many nations including Sri Lanka. This will definitely assist south south cooperation as mentioned by President Xi. The developed world has an important role to strengthen this cooperation and could assist to narrow the South North gap between the developed and developing nations without seeing it as a threat. Sri Lanka as one of the initial members of Bandung with Sir John Kothalawella’s presence at the conference during the time we came out of the colonial rule was the initial step for the non aligned summit held in Sri Lanka. Today we live in interesting time where China is reviving the ancient MSR the one road one belt strategy and United States pivot to Asia, Sri Lanka should look at playing a positive sum game with the existing and the emerging powers. The Yahapalanaya Regime made a great blunder by slighting the visit of President Xi Jing Ping’s visit to Sri Lanka. The very same people and their progeny who profited from the Rubber – Rice pact of the fifties, who grew up on the very rice that Communist Chinese provided were ungrateful enough to throw mud at the hand of friendship offered. It will take a long time for the idiots in Sri Lanka to realise their mistake. They are in a class of their own. What can we expect from a nation who forgot what Sri Lanka was 6 years ago? This entry was posted on Monday, April 27th, 2015. You can follow any responses to this entry through the RSS 2.0 feed. You can skip to the end and leave a response.